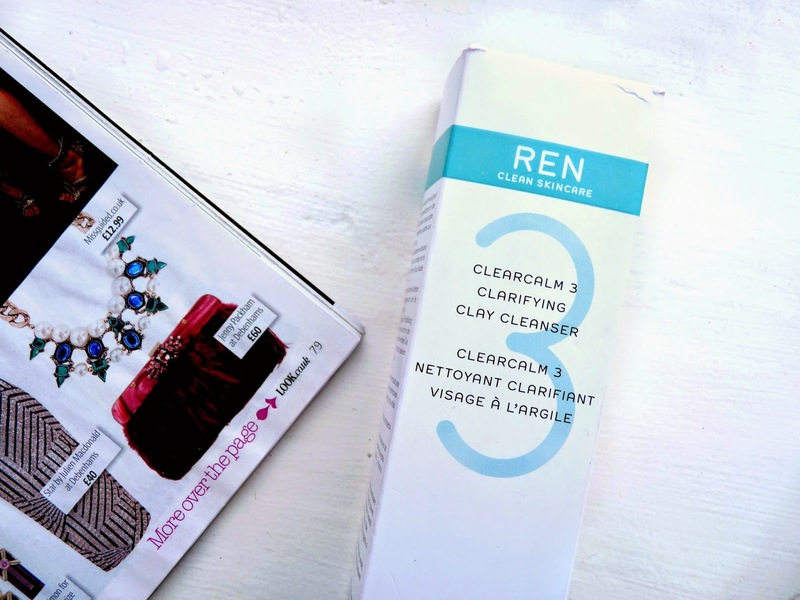 I've talked about this REN Clarifying Clay Cleanser quite a bit in past both on my blog (see My Evening Skincare Routine) and on Twitter and I thought it was about time I wrote a full review of it, particularly as I've been raving about it so much. This clay cleanser is specifically designed for people with blemish prone, oily skin which is completely suited for myself as that is my skin type down to a T. Using this was very new to me in a number of ways as it is first time I've tried anything by REN and also the first time I've used a cleanser in clay form; I've used clay masks and loved them, but this was the first clay cleanser I'd ever encountered, so I was eager to find out how my skin would react to this. To be honest, I did have high expectations. REN is praised by a lot by one of my favourite bloggers Kate of gh0stparties.com and its ingredients list looked pretty much perfect as you won't find a trace of mineral oil, Parabens, Sulfates, Glycols or any other nastiness in this product; exactly how I like it. From first use, I fell in love with this cleanser. Despite being quite a thick consistency, it isn't too messy to apply and is easy to distribute around your whole face easily, but I did find I ended up with quite a bit left on my fingers which isn't really the end of the world but I can't help but feel like it's a bit of waste of product. I either then massage this into my skin using circular motions for around 60 seconds or use my Magnitone Lucid cleansing brush to achieve a more thorough cleanse. I 100% feel the benefits of this cleanser more when I use the Lucid, but if you don't have one this still one heck of a good cleanser either way. Rinsing away, my skin instantly feels squeaky clean and refreshed. It isn't at all drying which I half expected it to be (being clay and all), but rather very soothing to my skin, giving it a soft texture. After the first week of using of an evening, the number of blemishes I had diminished dramatically, giving me noticeably clearer skin. I had a good few weeks of amazing skin but recently some of my blemishes have returned unfortunately, despite the fact I've still be using this. But, I take that with a pinch of salt that's just the way my skin is and the other benefits of this cleanser still make this the best cleanser I've probably ever used. The texture of my skin has looked and felt gorgeously smooth and visibly less oily. I've found that during the day I'm not required to blot or re-apply powder at all during the day whilst at uni or out and about. Even when I have a no make-up day, my skin doesn't feel like it becomes oily barely at all whereas previously it would be oily by the end of the day. I'm almost at the end of my first bottle and I've no doubt that I'm going to repurchase this as soon as I run out. This REN clay cleanser has been a game changer for me, I don't think I've used a cleanser in such a long time that has made my skin feel as nourished and as improved as this has. A must buy for anyone with the same skin issues as myself! Great review, I've been wanting to give this a try for a while now, seems like a pretty solid product! Ooh! This product sounds fab! i will have to add it to my xmas list! I love clay products! I may check this one out because I love when masks have a thick consistency. I've been breaking out lately so hopefully it helps out with hormonal acne! doitfortheirony.blogspot.com / Funny creator style person.